On June 5, the eve of AL's 24-hour countrywide hartal, unknown assailants set a double-decker bus on fire in front of Dhaka Sheraton Hotel. Nine passengers were killed and 15 others injured in the arson attack. Six people were said to have been incinerated in the bus while a burning man jumped to death on the street and two others, including a two-year-old girl, succumbed to their injuries at DMCH. The bus was already charred, with the seats and other flammables burnt out before fire fighters could put the fire out. Police said the perpetrators probably poured gunpowder on both decks of the bus before setting it on fire. Though no one was named, police indicated that the perpetrators were known, and that such incidents often occurred before hartals. The casualties in the attack -- in which a wife burnt to death in front of her husband's eyes and a daughter died on her mother's lap -- could have been less, said a witness, if the driver had stopped the bus right after it had caught on fire but he kept going even after the passengers started screaming. There were a number of bomb attacks on other public transport that evening, including buses and minibuses in the Mirpur area, near Rampura TV station, Mugda and Shyampur, while there were explosions in Gulistan 1, Shukrabad, Gabtoli, Motijheel and Paltan. For the last couple of months Bangla Bhai, the infamous commander of JMJB, seems to be everywhere. Not a single day passes without his life size portrait flashing the front page of one daily or another. Almost everyday there is a new harrowing tale of the vigilante group in one newspaper or another. But perhaps the most interesting part of the story is the role of the police. The police who have won almost every possible bad name have added a new feather in their illustrated crown. They have not only done nothing to stop Bangla Bhai but provided both logistic and moral support in their heroic ventures. Recently one of Bangla Bhai's lieutenant by the name of Hemayet Hossain Himu, caught and later released by the police gave names of some high profile ruling party members, who, he claimed, masterminded the Bangla Bhai drama. Will the government who always loudly denies of any state sponsored terrorism arrest the named minister and other party leaders? No way. Even Bangla Bhai wasn't arrested though the order came right from the Prime Minister, let alone the big wigs like minister and state minister. Beleaguered US Defence Secretary Donald Rumsfeld came to Dhaka on a brief tour last Saturday amidst a general strike called by the main opposition. Radical Islamic organisations and different left political factions observed a countrywide protest against what they called the visit of the Butcher of Baghdad to the country. Rumsfeld's visit however was a miserable failure. According to the newspaper reports, the visiting defence secretary "casually asked" the matter of sending Bangladeshi troops to Iraq, which was summarily turned down by his Bangladesh counterpart. Rumsfeld’s reaction was not at all annoying. Being asked if he wanted the country's contribution to Iraq, Rumsfeld said, " If I answered this question and say yes, obviously it would suggest I have asked them which I haven't. And if I say no, it would be implied we didn't want them. In any case, it would be unfortunate," Rumsfeld said. "I think it is up to each country to decide what it is they would like to do. I am sure each country is perfectly capable of making those decisions," he continued. The incident only suggests how lonely and isolated "world's biggest superpower" has become, particularly among its Muslim friends. Special Superintendent of Police (SSP) Muhammad Abdul Baten denied the allegation brought by Lutfuzzaman Babar, the state minister for home. According to the charge, Baten went to the minister's office to offer bribe with the intention to persuade him to cancel his transfer to Khagrachhari. What he said while he was questioned in police custody tells a different tale. Baten, the SSP of the Criminal Investigation Department (CID), revealed to the investigators is that he went to the state minister's office to discuss a file regarding the killing of Awami League legislator Ahsanullah Master. The police press release mentions the existence of the file, but according to the charge Baten placed Tk three lakh on the minister's table, to which Baten's response was that he "was framed, and has been a victim of conspiracy". He also said that he had an altercation with the minister over the case of the arrest of the killers of Ahsanullah. Yet the allegation puts him in between a rock and hard place. According to police, Baten left the room and called the Inspector General of Police (IGP), who promptly arrived on the scene and suspended him upon seeing the packet of money on the table. 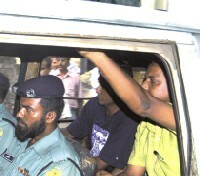 Baten was arrested on June 3, and was kept in police custody for one day on June 5. Meanwhile, a police officer, who wanted to remain anonymous, said to the journalists that Baten's involvement in the Ahsanullah murder case may have landed him in this soup. Reports in the newspapers also lent credence to his claim. However, a press release has been issued by the police headquarters refuting all this. It said that the CID took over the investigation of the Ahsanullah murder case on May 10, and the four-member team that had taken over the charge did not include Baten.